A recent small study showed that lack of chewing power may be associated with dementia or cognitive degeneration. If you have problems chewing you should not immediately react as if you have a life threatening disorder. The study that was performed is very small and the results have not been analyzed very deeply. With that said, of the 557 people who were polled, those who had trouble chewing apples and bread were discovered to be twice as likely to suffer from brain impairment. It is still uncertain whether the association is that poor dental health can lead to cognitive issues or if cognitive issues may lead to trouble chewing. There is also the chance, because of the small sample size, that the association found by the study is pure coincidence. Whether this discovery is something to worry about or not, our dentist in West Hollywood believes that good oral health can lead to better total body health in many ways. By scheduling regular dental exams and addressing any chewing issues or other oral health problems patients are more likely to keep up their oral hygiene, eat healthier foods, and more of the bacteria that can lead to health problems like heart disease and diabetes will be eliminated from their mouths. 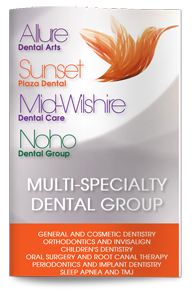 If you have trouble chewing for any reason including tooth decay, TMJ, or periodontal disease, contact our office today to schedule a consultation where our West Hollywood dentist can treat any issues you have.